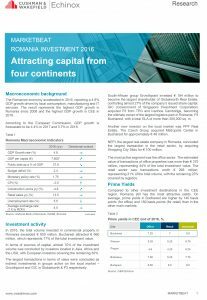 • The Romanian economy accelerated in 2016, reporting a 4.8% GDP growth driven by local consumption, manufacturing and IT services. The result represents the highest GDP growth in Romania since 2008 and the highest GDP growth in CEE in 2016. • In 2016, the total volume invested in commercial property in Romania exceeded € 850 million. Bucharest attracted € 660 million, which represents 77% of the total investment value. • The largest transactions in terms of value were concluded as indirect investments in groups active on the local market – Growthpoint and GIC in Globalworth & P3 respectively. • Compared to other investment destinations in the CEE region, Romania still has the most attractive yields. On average, prime yields in Bucharest are higher by 140 basis points (for office) and 180 basis points (for retail) than in the other main markets.